Have you ever prayed for something for a long time, trusting that God will guide and provide like only He can – and then something happens in response? That is His work in your life. For people who haven’t yet experienced that personal relationship with God, this concept will feel really out there. For those of us who talk to Him and ask for His guidance, we know EXACTLY what this means. I’ve observed that Christians who are active in their faith lead more positive and impactful lives. They live by Christian principals like kindness, love and mercy. That personal relationship with God begins in church. Church is where I gain strength. The music and messages are positive; they have always and continue to keep life in perspective for me. I was raised in a family where my Christian faith was an open conversation and we practiced our faith by being involved in our church. I sang in the children’s choir; my mother served on the alter guild; my sister and I both were involved with the youth group. I am grateful that my family took me to church when I was a little girl; it set a good foundation for the relationship I have with God. The people in the little Episcopal church where I grew up are special to me. Many of us lived in the same neighborhood and went to the same school. I hung out with the kids in my youth group. Sometimes we got into trouble. Regardless, that good, church community was and still is there for me. Now, my son and I are members of a really large Methodist church. There are over 5,000 members and even though it is much larger than the church community that I grew up in, I have deep relationships with clergy, staff and other members. Being involved and volunteering with church programs has helped me establish deeper relationships with the people that I usually see in the building on Sunday morning. Sometimes I miss the Episcopal church that I grew up in. My relationship with God grew deeper after my mother died. I was 34 years old; Mama was the person I’d always told all my plans to and sought advice from; she was my best friend. To ease the pain of my grief, I started talking to God; and I started seeing His hand in the way my life unfolded. I felt a strong connection to Him because I’d grown up with it. Proof that the things we expose our children to now will be part of who they become as adults. Which is why I believe that by taking my son to church, he is learning about Christianity and how to practice his faith. He knows that I talk to God and put my trust in Him for the plans for our lives. At home, we talk about how God wants us to handle things like anger, love and friendship. 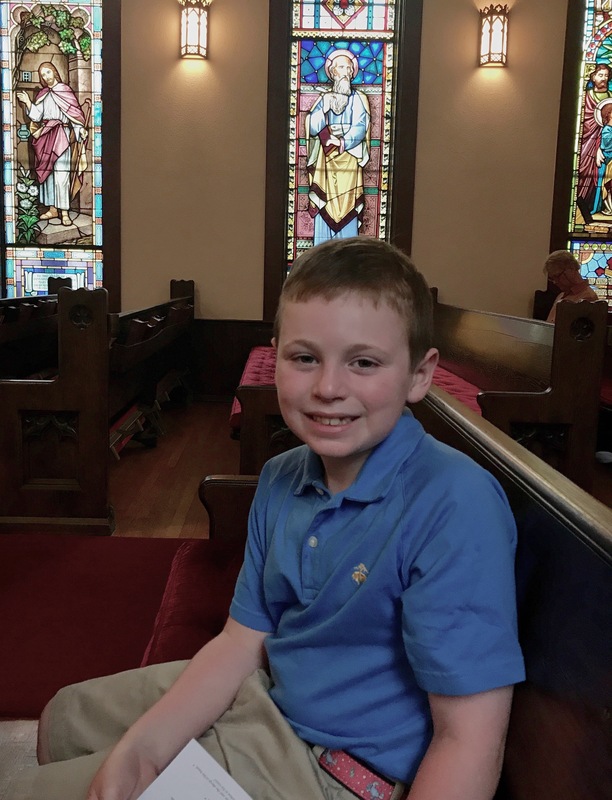 At nine years old, he’s just learning to manage his feelings and channel his energy; although he makes poor choices and acts out like most kids his age, he hears those same messages about anger, love and friendship at church. It’s the beginning of that relationship and connection for him. Because of all my son experienced, he has a deeper understanding of his faith than most children his age. He trusts God and in Heaven. We pray at meals. He is in choir and participates in church programs. It’s a central part of our social life. I hope he never experiences a tragedy as deep as the pain I’ve felt in losing his brother. Regardless, I am teaching him that no matter what lies ahead, he should continue to follow the basic principle of Christianity – and that is to love. I start every morning with a conversation with Him. When I am working through a stressful situation or decision, I ask Him to show me how He wants me to move forward. Sometimes I pray about the same thing for months before I see a sign from Him. When that sign comes, it often comes with such certainty that it takes my breath away. I am reading “The Journey” by the late Reverend Billy Graham. He writes about how to live by faith in an uncertain world. I’ve said before that I am total type A. I am a planner. Even though I have learned that my plans are not the ones that matter, it is still hard to let completely go of anxiety over the future. I find that reading books like this one help me keep things in perspective while I wait for God’s Will to play out in my life. Waiting on His timing for things that I pray about is frustrating. Sometimes I do not get the result that I was praying for. I have to trust that His will is best for me; even when it’s not what I hoped for. Have faith. Trust Him. He goes ahead of you and will not leave you. I tell myself these things every morning to calm my own anxiety about the future, so know that you are the only one with uncertainty about life. Let’s do this together. I so needed to read this today. Thank you. I must pray more.. anxiety is a HUGE factor for me. Thank you . Meg, this was a wonderful read. You are a special mom. You have inspired me in many ways. Thanks! I needed to read it again today! Love you girl!